The big double gameweek 34 for FPL is arriving this weekend. With 15 matches being played and ten teams with double matches it is a good chance to make up ground in the rankings and mini-leagues, if you pick the right players. The one problem is that many of these teams playing two matches in week 34 then have no Premier League match to play in week 35. This includes Crystal Palace, Everton, Manchester United, Norwich, Watford, and West Ham United. All of these teams, except Crystal Palace, then have another double gameweek in week 37. The key to finishing this FPL season is going to be planning, especially for those who still have their wild card and at least one of their chips left. This is prime time to start using those chips and preparing your plan for each gameweek in advance. Without the extra preparation, there’s a good chance at missing out on some much needed points. The teams to really look at picking from in week 34 include Arsenal, Liverpool, Man City, Manchester United, and West Ham United. The caveat being that Arsenal and Man City are the only two who then have a match in week 35, but neither have a double match in week 37. One possibility would be to pick up players from Arsenal and Man City then play a wild card in week 37 to prepare for the final double gameweek along with the final matches of the season in 38. An alternative would be to pick from those teams who have a blank in 35, then play the wild card for week 35. The problem here is that then there’s a chance of missing out on double gameweeks for the likes of Everton or even Chelsea and Manchester United. Whatever the plan is, make sure to check out the fixtures and decide which players you want from which teams for each gameweek and prepare ahead of time. Everton have certainly been slumping of latte with four straight losses which means that the one team that many FPL managers were really banking on have finished one of their three double gameweeks in horrible form. In week 34 they face Southampton (H) and Liverpool (A). Both are teams that have been playing well lately and with Liverpool also playing a double gameweek in both 34 and 37 they are a much better pick. In fact, there are many other better picks than to go with Everton players, including Lukaku who has not score in three matches. With Southampton’s defense it doesn’t look likely that he will be getting any goals on Saturday, however, Liverpool have struggled defensively this season and that could be a place for him to pick up points, even if Everton don’t. 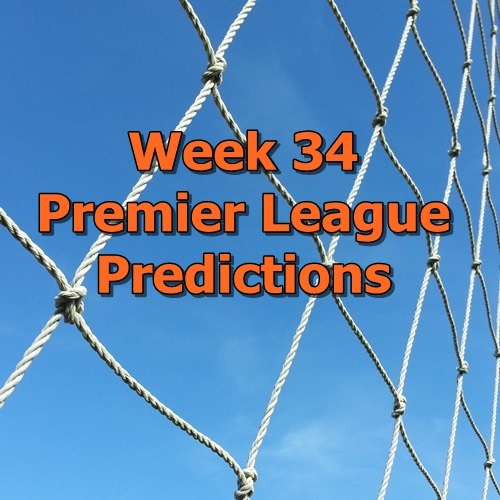 Here are the week 34 Premier League predictions including all 15 matches. When preparing your FPL teams be sure to check out the matchups and as always I wish you good luck and have fun!